Happy Thanksgiving Democrats, we have a guide to help at dinner! We hope you are enjoying time with your loved ones this holiday. We are thankful for all of the candidates that are putting their name on the ballot to protect our families. Strong Democrats running from US Senate to School Board need your help spreading the word about their elections. Check out our constantly growing list of Democrats running. We are also thankful for sitting around the table talking about politics this holiday season. 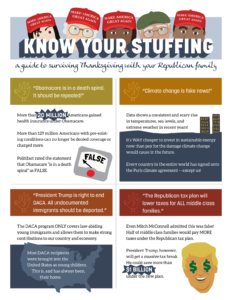 We know our families come in all political stripes, so this fun Thanksgiving Guide should come in handy for the inevitable talk about climate change, Trump and Obamacare.